Bright daylight scenarios is where modern-day smartphone cameras should have no issues, but they provide an interesting ground for comparison on color rendition, exposure and dynamic range. Our first sample immediately exposes the differences in coverage between the four cameras, differences we'll inevitably be seeing in all shots. The iPhone 7 with its 4:3 aspect and 28mm-equiv. lens captures the least in the horizontal direction. The LG G5 has a similar focal length, but the 16:9 aspect lets it have a much wider horizontal field of view - you'd appreciate it if you shoot mostly landscapes. The Galaxy S7 goes wider than the iPhone 7, but there's no beating the Xperia for coverage. Another apparent outcome of the high-intricacy patterns of the shade panes is the moire - visible on all but the Galaxy S7. Samsung's processing, on the other hand, has eliminated most of the fine texture there and made it look like diamond plate instead. The iPhone 7 may not have the megapixels to be able to resolve the actual patterns either, but does do a somewhat better job of staying true to reality, even if it does exhibit moire as well. The Xperia XZ has plenty of megapixels to throw at those patterns, and it does a good job of resolving them, with the caveat that there's a fair amount of luminance noise mixed in too. The G5 has no such issues and excels at resolving fine detail. Continuing with the pixel peeping, it's hard to overlook the Xperia's inability to render any part of the scene without introducing noise - it's especially visible in the sky. A closer look at the windows and window frames reveals an even higher number of speckles of noise around the contrasting edges. The photos by the competition have no similar issues in good light. The second set of samples is instrumental in pointing out the differences in color reproduction. The iPhone 7 is by far the most conservative (you'll notice a trend there as we move on) keeping the tree leaves looking natural, if a little subdued. It may appear a bit dull compared to the others, but it is arguably the truer representation of reality. At the other end of the spectrum, the G5 goes completely bonkers with saturation and orange quickly turns to red - there's fall colors and then there's the G5's fall colors. The Galaxy S7 is on the punchy side as well, only it tends to shift its greens towards yellow. The Xperia XZ doesn't go to extremes in its Superior Auto-selected landscape mode, but still produces visibly punchier shots than the iPhone. In the iPhone-ception that follows we took a few shots of an iPhone inspired graffiti. 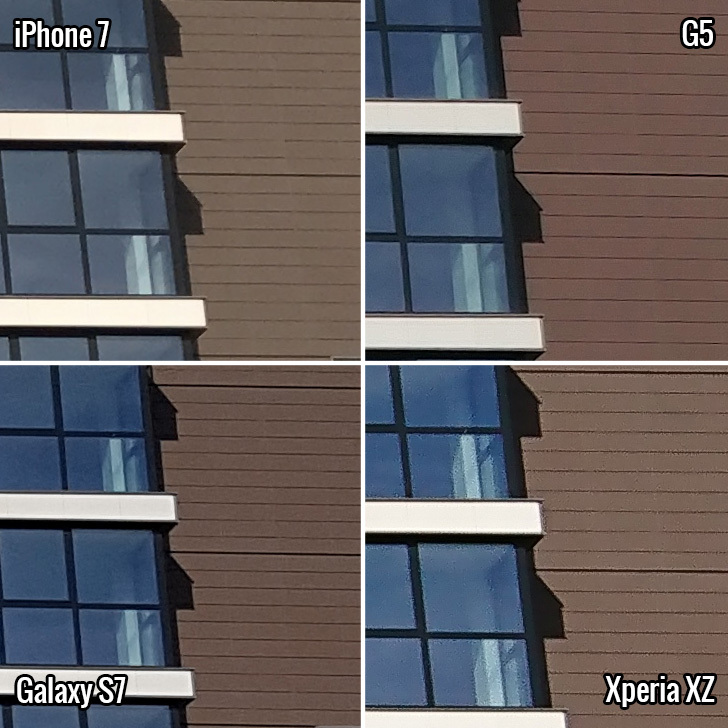 There's all the detail in the world in the stucco, but we'll be looking at the corners this time - the Xperia XZ exhibits a common flaw of Sony flagships - corner softness. The competition is plenty sharp across the frame. This particular sample also reveals the differences in dynamic range. The dynamic range is the amount of the highlights and shadows that the camera can capture simultaneously. Unlike the human eye, camera sensors are limited and when you take pictures of bright lights and dark shadows they have to make choices whether to capture the highlights or the shadows better. The wider the camera's natural dynamic range, the fewer compromises it has to make when taking these choices. While all four phones have areas of clipped highlights (depicted in yellow) in the same spots, the iPhone 7's clipped areas are the smallest. The Galaxy S7, on the other hand, has underexposed shadows (marked in green on the screenshots). The G5 suffers as well, though to a much smaller extent. The tile pattern on the next set of photos shouldn't challenge a contemporary flagship, but oh, my! 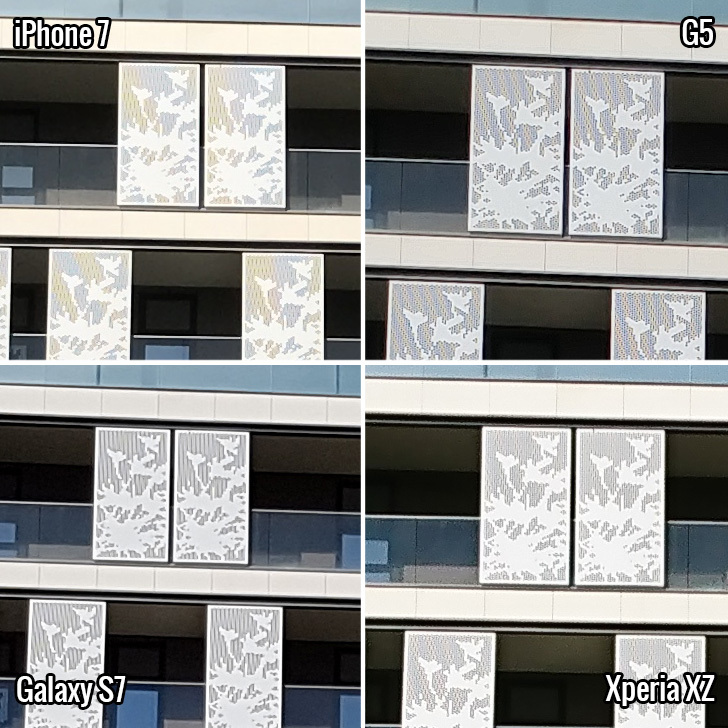 how noisy each and every tile in the Xperia image is. And how joyously red that logo is in the G5 sample, as if we took a few years to let it fade until we shot it on the iPhone 7 (hint: it's not as red in real life as the G5 renders it). Also check out the word 'station' in the logo. This time, the iPhone 7 has struggled with the highlights but that's because it chose a brighter overall exposure and not due to dynamic range constraints. The contour of the letters has blended with the fill and it's all clipped to white. The competitors make a clear distinction between the two. We did shoot a whole bunch of photos with the smartphones, naturally, and here are some more samples, in no particular order. The LG G5 is unique in this group here in that it has a second camera on its back - an 8MP wide-angle shooter. LG touts a field of view of 135-degree angle and you obviously can't expect it to be fully rectilinear, not in these dimensions for sure. It is, nonetheless, a fun creative tool if you learn to live with its inherent limitations. It's fixed-focus, but with a lens this wide, a focus set close to infinity would cover most of any scene you attempt with it. The images are reasonably sharp, as long as you stay away from the edges of the frame. Even dynamic range is pretty good. Here, take a look. Daylight photos winner: LG G5. The G5 resolves the most detail, while keeping noise levels low. Dynamic range is very good as well. The one area we have reservations is color reproduction - there's no denying that colors are oversaturated, but that may very well be what users are looking. The second rear camera scores another point for the LG flagship.